Susanne Barrett: To NaNo or Not to NaNo...That Is the Question! To NaNo or Not to NaNo...That Is the Question! 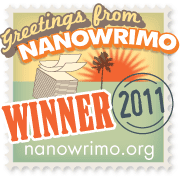 I've taken part in the National Novel Writing Month (NaNoWriMo) several times in the past few years. 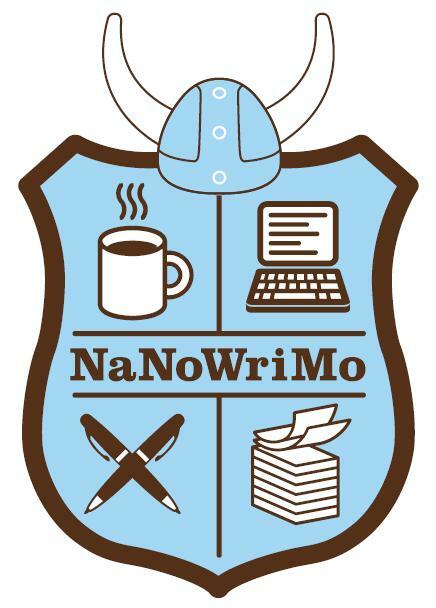 NaNoWriMo involves writing a 50,000-word novel during the month of November; the fun part is that NaNoWriMo is a global effort; participants do the challenge with over 300,000 other writers around the world. One can have Writing Buddies, and participants also receive encouraging e-mails from some fairly impressive authors; participants may update their progress daily. 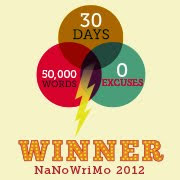 NaNoWriMo provides some fun bells &amp; whistles that allow progress to be posted on blogs or websites. With a bunch of my online friends, I joined up in 2008 and managed to write half of a highly-autobiographical novel called The Pilgrim Pathway that I doubt I'll go back to edit; it was a decent first attempt at writing fiction, but it isn't really interesting or publishable. In 2009 I completed the second half of The Pilgrim Pathway. I took a break in 2010, participating in a poem-a-day challenge on the Writer's Market website, hosted by the editor of Poet's Market. I don't think writing a poem a day was much of a "break"; it was actually more taxing than writing the 1,667 words daily to complete NaNoWriMo. In 2011 I returned to NaNoWriMo, challenging the students in my homeschool co-op expository writing class to join me for extra credit. Between teaching two co-op classes and an online course through Brave Writer, plus homeschooling the boys, it wasn't easy to find time to write 1,667 words per day...which I rounded to 2,000 words/day to keep it easier to track plus allowed me to take off Thanksgiving and a few other days (such as teaching days). But I still ended up posting 14,000 words on November 30, verifying the completion of 50,000 words with eight minutes to spare. Whew! So, with only one co-op class to teach (but with more students than last year) and the same Brave Writer online class going, plus the three boys to teach, should I attempt NaNoWriMo this year or not? Last year I completed one of the novels I have been publishing online in weekly installments, and I managed to get several chapters ahead on another novel I have also been publishing online. If I attempt NaNoWriMo 2012, I will be completing the second online novel and then either starting a new novel or completing several unfinished short stories. I would love to be that productive!! However, the problem I ran into last year was that as I post a new chapter online each week, I have to go back and edit that chapter for publication. Yikes! That's a lot of extra writing!! I am offering the same extra credit incentive to my co-op writing class as I did last year, so I will need to participate somewhat so that I can track their progress. Plus, at least one member of our small town's writing group is participating, and we meet once a week during NaNoWriMo to write together in the library. In addition, a lot of writers in the online communities where I post my fiction are doing NaNoWriMo, and I've made two NaNoWriMo accounts, one under my real name for my students' benefit, and one under my pen name for chatting with my fellow fiction writers. 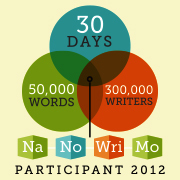 So, should I participate in NaNoWriMo or not? I'm hoping to, but I suppose we'll see if it's realistic to actually finish. So I suppose at this point that I will TRY, but know that I may not finish this year.